Success of a car wash depends to a large extent on the qualities of the site location. Site refers to the physical property, whereas location refers to the market area within which a property is found. For example, if a developer is looking to create a network of stores in a region, he must decide which of the potential locations in the area are the best. If the developer wants to build a wash, he must decide if the site location is strong enough to attract viable retail operations, whereas an operator of a going concern would need to decide on adaptation of services if the site location characteristics changed somehow over time. The market area for retail outlets such as car wash contains between 70 percent and 80 percent of a store’s customers. The remaining support is attributable to consumers who randomly pass by. The distance consumers are willing to travel — or market range — defines the retail trade-area boundaries for stores. Beyond this range, consumers are less willing to travel because of economic distance, a more proximate store, or some other reason. To illustrate, we created a diagram (see left), combining location information to generate influence areas for the purpose of assessing locations and identifying new ones. 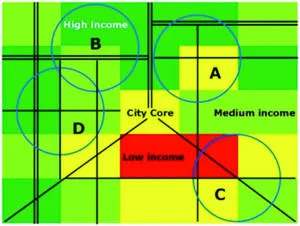 Let’s evaluate trade areas A and C. Here, A has one-half the population density of C but more robust household incomes. So, we would ratchet down further to assess surrounding developments. Here, we find density, variety, and tier of support services in area A are superior to C. For example, A has Walgreen’s, CVS, Public’s, and Chick-fil-A, whereas C has Walmart Neighborhood Market, Aldi, Dollar General, and Checkers. We would also find A superior to C in terms of traffic. Area A has major highways and connector roads that link the area to other shopping destinations and residential areas in region. Whereas C contains a fewer number of major roads, less total traffic volumes, and more commuter traffic that is much less likely to make a convenience stop. Another developer may decide trade area B is best because it has the highest traffic volumes, most rooftops, and most robust incomes. Area D might be the choice over area B for another developer because real estate values are lower and it’s easier to obtain permits. Consequently, it’s important to have a basic understanding of the relationships between household statistics, traffic patterns, and trade area boundaries. For example, a rule of thumb for highway-oriented businesses like convenience stores and gas stations is a signal-controlled hard corner on the going-home side of the street. However, these site characteristics are less of a factor today because experience shows people are willing to make a hard left turn against traffic to save three cents a gallon. And finally, if demography, competition, or regulations would change measurably in the future, an operator might decide it’s necessary to change certain store attributes. This might include brand image, prices, implemented services, and store design. Bob Roman is president of RJR Enterprises – Consulting Services www.carwashplan.com. You can reach Bob via e-mail at bob@carwashplan.com.